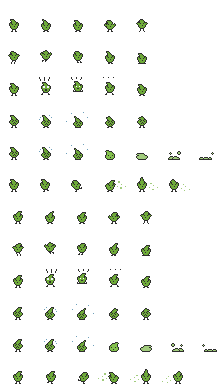 A leaf elemental sprite sheet you can use for any 2d game you are building! This is so sugoi! Good job! Adorable! Great work, thanks for sharing! All your works are so inspirational! Dude. You come up with some of the most creative and unique character concepts...even the "standards" have their own personality. Not really doing 2D gaming at the moment but really appreciate your work. Well done.